Tom Impallomeni is here to pitch Tribe XR, a VR app that teaches people to DJ. He’s got a vision for using virtual reality to teach creative skills — but the investors are skeptical. Can Tom convince them he’s putting the right spin on VR? Today's investors are Sarah Downey, Michael Hyatt, Charles Hudson, and Phil Nadel. When Khalil Zahar and Tommy Duquette first pitched their boxing workout startup, Hykso, the investors saw a big opportunity. They wanted to know: Could Hykso be more like Peloton, an at-home cycling system that was starting to take off? Three years later, the company is trying to do just that — and it’s been a wild ride. Today’s investors are Jillian Manus, Phil Nadel, Howie Diamond and Jake Chapman. Jonathan Kumar pitches his startup, Samaritan, which aims to help people who’ve lost their homes. But can he convince the investors it’s OK to earn a profit off of homelessness? Today’s investors are Charles Hudson, Michael Hyatt, Jillian Manus and Phil Nadel. Ben Walters came on the show to sell the investors on Feedback, an app that lets restaurants change their prices on the fly. But when Ben shows up in the pitch room, he’s already decided that it’s time to make some changes to the business. Can he get the investors salivating over a startup that’s mid-pivot? Today’s investors are Jillian Manus, Charles Hudson, Phil Nadel, Michael Hyatt and Sarah Downey. After a stellar pitch on our show back in 2017 — one that got $100K in the first five minutes — founder Mike Slagh hit the ground running with his startup, Shift. In this episode, we catch up with him to find out if Shift, a job-placement service for military vets, has continued to dazzle investors.Today's investors are Jillian Manus, Phil Nadel, James Altucher and Daniel Gulati. Jennifer Brandel of Hearken is pitching a new kind of business. She calls it a zebra: a company that’s driven by a mission — but still wants to make money. And Jennifer’s mission with Hearken is to help journalists do their jobs better. But can she and the investors get on the same page? Today’s investors are Jillian Manus, Charles Hudson, Phil Nadel, Michael Hyatt, and Sarah Downey. Rama Poola is here pitching his airline ticket business, SkyHi, where customers pay a monthly fee to access tickets on the cheap. But the investors are worried that it sounds a lot like MoviePass, a company that offered a subscription for unlimited movie tickets — and ran into a world of problems. Can Rama convince them that his model won’t break the bank? Today's investors are Alexandra Stanton, Sheel Mohnot, Charles Hudson, and Phil Nadel. Ryan Husk wants to take your workplace culture up a notch. His startup, Culture Force, matches companies to “experiences” designed to improve community at work. He says it can be a huge business, but the investors want to know why it’s more than just a cool way to plan work parties. Today’s investors are Jillian Manus, Charles Hudson, Phil Nadel and Michael Hyatt. Chelsea Brownridge wants to help dog owners keep their pooches safe when they’re out running errands together. Her startup, DogSpot, makes internet-connected dog houses, with features like webcams and A/C, and puts them in front of retail stores that don’t allow pets. Can Chelsea convince our investors that her dog houses are a must-have? Today’s investors are Jillian Manus, Charles Hudson, Phil Nadel and Michael Hyatt. After losing his shirt on sports betting sites DraftKings and FanDuel, Adam Weinstein decided to flip the script on daily fantasy sports and give everyone a better shot at winning. He’s changing things up using prop bets instead of traditional fantasy teams. But the question remains: Is this a gamble investors are willing to take? Today's investors are Sarah Downey, Michael Hyatt, Charles Hudson, and Phil Nadel. After a failed pitch on our show back in 2017, Industrial Organic founder Amanda Weeks was ready for redemption. And she found it, to the tune of $4.2 million. Now she’s back — with a lot to say about how much she and her business have grown. Today's investors are Jillian Manus, Phil Nadel, Howie Diamond, Jake Chapman and Sheel Mohnot. Zahra Kassam has been on the road in a major way, pitching her startup, Monti Kids. A few months before our show, she pitched on ABC’s “Shark Tank.” Today we find out: Did she win over any investors in her two very public pitches? And how do our investors compare to pitching the sharks? Today's investors are Alexandra Stanton, Sheel Mohnot, Charles Hudson, and Phil Nadel. Tom Impallomeni is here to pitch Tribe XR, a VR app that teaches people to DJ. He’s got a vision for using virtual reality to teach creative skills — but the investors are skeptical. Can Tom convince them he’s putting the right spin on VR? Today's investors are Sarah Downey, Michael Hyatt, Charles Hudson, and Phil Nadel. Debbie Wei Mullin is pitching her pour-over Vietnamese coffee startup, Copper Cow Coffee. The company is already doing well on Walmart’s shelves. But does she have what it takes to take the brand online? Today's investors are Alexandra Stanton, Sheel Mohnot, Charles Hudson, and Phil Nadel. After a frustrating round of fundraising for her company PopCom, Dawn Dickson decided that VC was broken. She opted to take a different route: an initial coin offering, or ICO. But then her best-laid plans got all mucked up ... by Uncle Sam. Today's investors are Jillian Manus, Daniel Gulati, Phil Nadel, and Michael Hyatt. Josh sits down with the investors to ask about the most memorable pitches in 2018: the good, the bad, and everything in between. The pitches mentioned in this episode are #29 ShearShare, #32 Boundless, #35 Petit Pot, #39 Bluffworks, #41 Shipsi, #42 Bounce, #45 SVRF, #49 Blake’s Seed Based and #51 Cushion. 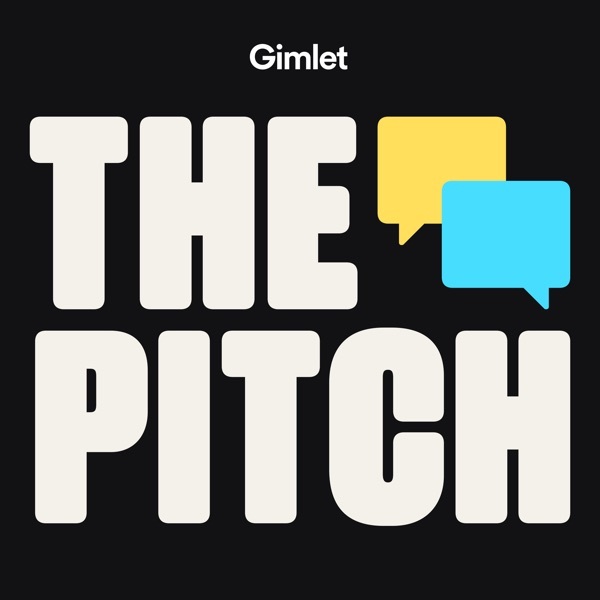 This week, The Pitch is live from The Wharton School at the University of Philadelphia. Three of Philly’s most promising young startups take the stage in front of Phil Nadel, Jillian Manus and a packed house for a live pitch competition. Back in 2016, Sudden Coffee founders Joshua Zloof and Kalle Freese tried to sell the investors on their premium instant coffee. Two years later, we checked back in with Joshua and found that Sudden Coffee is still working out some kinks in the business: trying to find the right customers and nailing the flavor. Today’s investors are Jillian Manus, Phil Nadel, Howie Diamond and Jake Chapman. Susan Sierota wants to help dog owners keep their furry friends healthy with her pet-tech startup, Waggit. Can she convince the four investors that her smart collar will win best in show? Today's investors are Alexandra Stanton, Jake Chapman, Charles Hudson, and Phil Nadel. Founder Paul Kesserwani says we’re all losing way too much money to fees — credit card fees, bank fees, ATM fees. And he thinks his company, Cushion, has the answer: A friendly bot that will battle those fees for you. Can he convince investors that there’s major money to be made in the fee-fighting business? Today's investors are Howie Diamond, Jillian Manus, Phil Nadel, and Michael Hyatt.